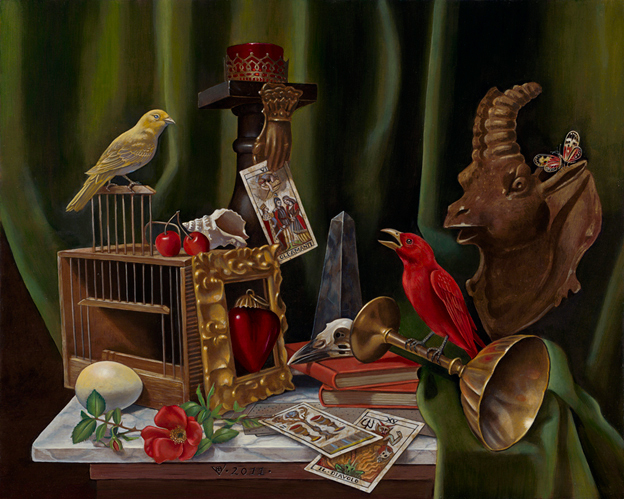 Benjamin A. Vierling is an American artist who is widely respected for his trademark rendering of arcane mysticism. Using predominantly a 15th century technique of mixing egg tempera & oil pigments, his work exalts the aesthetic ideal that art has the ability to unify disparate paradigms. Mythical references are integrated with contemporary subjects to bridge the timeless with the ephemeral in his iconic compositions. In this exclusive interview, he talks about the symbolism and meanings of the heart in his work. Please tell us about your background and the inner force to investigate the intersection of art and biological sciences. Benjamin Vierling: I am a fine arts painter and illustrator working in traditional media. I take inspiration directly from the nature, and utilize techniques informed by a rich legacy of art history. My fundamental approach to image composition integrates empirical observations with the timeless nuances of mythology. 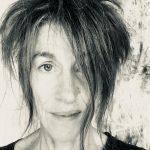 The foundation of image craft is the observation of the material world, and for this reason I regard the visual arts as a cornerstone to the sciences. The act of rendering is in itself a process of methodical study. I believe that the human portrait is the most basic of biological studies, as it builds a bridge between observation and interpretation, the body, and the face in particular, being the vessel which reveals the temperament of the subject. 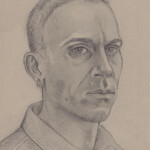 A well done portrait demonstrates the individual character behind the physical forms. Portraiture is in my experience, a profound method to understanding the human condition. My preferred subject for still-life composition is a genre known historically as a Vanitas, wherein mundane objects are grouped to demonstrate the ephemeral nature of all things. 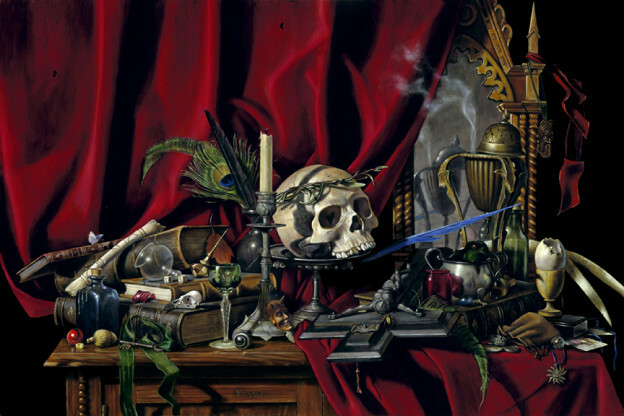 Allegorical elements such as a skull, an hourglass, an extinguished candle, books, and musical instruments are often included to punctuate the theme. Beyond the obvious symbolism denoting impermanence, these studies provide an intimate glimpse into the subtle relationships that exist between objects, which in turn demonstrates the complex dynamics of the human experience. In this sense, the cluttered still-life become much more than the objects inhabiting it’s illusory plane. What is the genesis of your artwork entitled ‘Sacred Heart’? 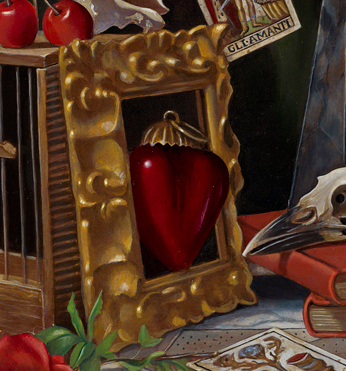 BV: In my painting of the Sacred Heart, I have integrated a traditional still-life genre with a theme from catholic mysticism, wherein the Sacred Heart of the Savior erupts in radiant life and divine love. The aesthetic of the composition is inspired by baroque-era floral paintings, most specifically the masterworks by Rachel Ruysch and Van Huysum, wherein several types of plants are grouped in idealized bouquets, often crawling with insects and small animals. These densely rendered compositions are in effect, studies of a hermetically sealed ecosystem. The meticulous hyper-realistic rendering of flora and fauna expresses the profound beauty of the macrocosm through adoration of the microcosm. Can you describe the plants that grow from the aortal chamber in ‘Sacred Heart’? BV: The three plants growing from the aortal chamber are Atropa belladonna, Datura stramonium, & Hyoscyamus niger, commonly known as Belladonna, Jimsonweed, and Henbane, three psychotropic and highly toxic species, which have particular significance in folklore and legend. 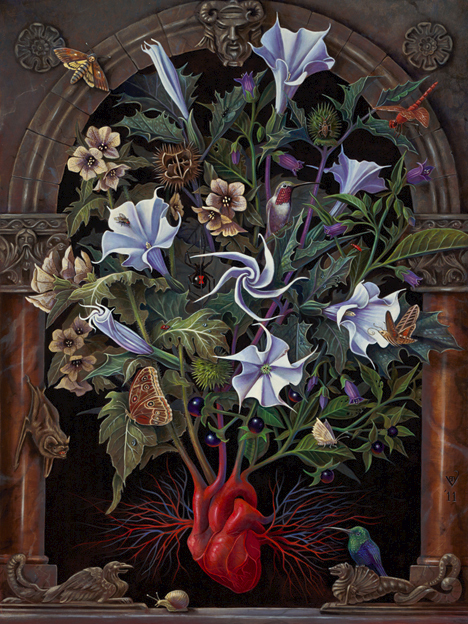 With the incorporation of poisonous plants, the allegory explores a less conventional concept, the expatiating function of the Sacred Heart devotion; the assimilation of baneful poisons is catalyzed by passion and manifests as visionary insights. The Heart is thus a crucible wherein the transformation takes place. The outpouring of virtue and venom sustains a diverse menagerie of small creatures. There are 13 individual species represented amongst the foliage and flowers. Their activities and interactions speak of the complex web of life that sustains them all, the Sacred Heart at the center. 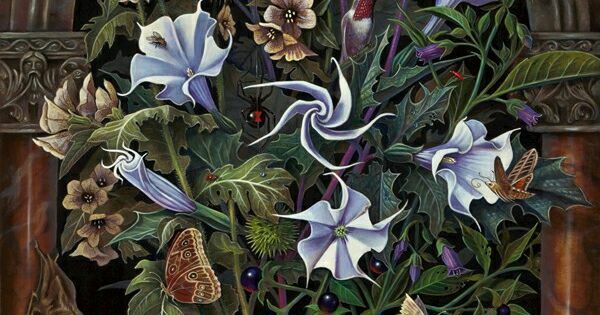 These are admittedly esoteric concepts, but at its core, this work is about the dynamic relationships that exist between flora and fauna, color and form, spirit and matter. The viewer is encouraged to enter into this beguiling realm to arrive at their own insights. What is the symbolism behind the artwork ‘Gli Amanti’? BV: Gli Amanti, The Lovers, is a romantic allegory, as demonstrated by the various subjects engaging one another within the composition. The seed of the subject is the Gli Amanti card from an italian renaissance tarot deck, which is clipped to the pillar behind the cage. This theme germinates throughout the scene, where numerous references to the amorous dance of the two lovers abound; from courtship, to union, attachment and separation. The heart is literally represented as a ruby-hued, glass ornament within a gold frame, indicating the central theme of the Lovers. Various objects dispersed throughout the composition testify to the powerful magnetism that exists between complimentary forces. Even the color palette was carefully chosen to emphasize the union of opposites. While a narrative is certainly implied, as with all my images, it is left to the viewer to interpret the story that best suits their own inclinations. Despite the many symbolic elements, I hope to encourage a process of discovery. The small cage for instance, is placed is such a way that one is compelled to wonder who occupied it, and what it represents. Is it a prison, or a safe haven? The door is open, was one of the birds released by the other? Perhaps one is encouraging the other to enter. Maybe they were both previously inside. For this reason the allegory of Gli Amanti is a fundamentally ambiguous one. Romantic love takes many forms, the stories innumerable. Flora and fauna have a great position in your work. Tell us more about your work “Foxglove plant, Digitalis purpurea” and what is the linkage between the Foxglove plant and the human heart? BV: This drawing was created for an upcoming publication by a contemporary herbalist and author, Daniel Schulke. The book is titled, The Green Mysteries, and is scheduled to be published by Three Hands Press in the autumn of 2016. This publication takes a thematic cue from the illustrated Herbals of yore, wherein the medicinal and magical properties of various plants are described by way of pictures and written descriptions. 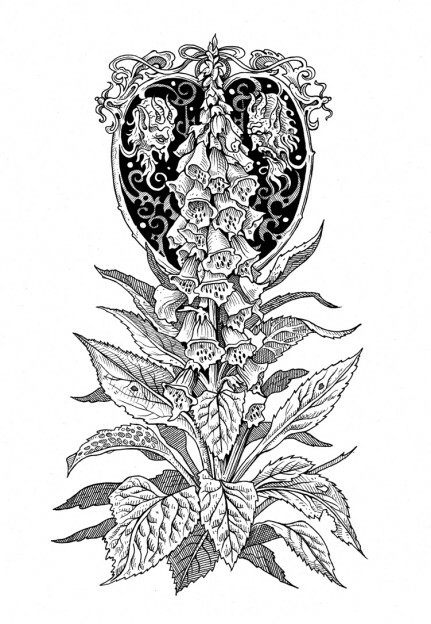 The book will feature over 250 individual illustration, of which Digitalis purpurea is but one. The Digitalis genus is well known for its visual beauty, and is commonly used in ornamental gardens the world over. The genus is also extremely toxic to humans and many animals. All the parts of Foxglove are poisonous, from the roots to the enchanting, trumpet-like blossoms. From this dangerous plant cardiac glycosides are extracted to manufacture a group of medicines called digitalin, which are used to treat congestive heart failure. Allusions to these various attributes of the plant are depicted in my illustration. Behind a realistically proportioned botanical rendering of the actual plant is a heart shaped geometric form, wherein the countenances of two satyrs face off on either side the digitalis blossoms, a labyrinth of veinlike ornamental shapes connecting them. To the right is the face of anguish and trauma, to the left is relief and revitalization. The delicate balance between poison and medicine is hereby punctuated. Botanical illustration in general appeals to me for its fusion of naturalistic study with fantastical nuance. The study of plants reveals infinite variations on basic structural forms, such as rhizome, leaf, stem, flower and fruit. By incorporating symbolic visual elements, and embellishing with all manner of creatures, the complex systems of connectivity that exist between flora and fauna can be explored endlessly to great reward.